Since leaving Japan in 1972 and basing herself in Europe, Leiko Ikemura has worked in a diverse range of media that include painting, sculpture and drawing, in her ongoing exploration of the fundamental meaning of human existence. It is not only overseas where she is highly regarded. Her steady development as an artist since the beginning of the 1980s has in recent years become widely known in Japan also, through, among others, her solo exhibition at the Vangi Sculpture Garden Museum in 2006, and her retrospective exhibition at the National Museum of Modern Art, Tokyo and the Mie Prefectural Art Museum (Mie being where she was born and grew up), both in 2011–2012. This exhibition being held at the museum for the first time in eight years will focus primarily on sculptures that harbor transfiguration as substances either on their surface or within them. 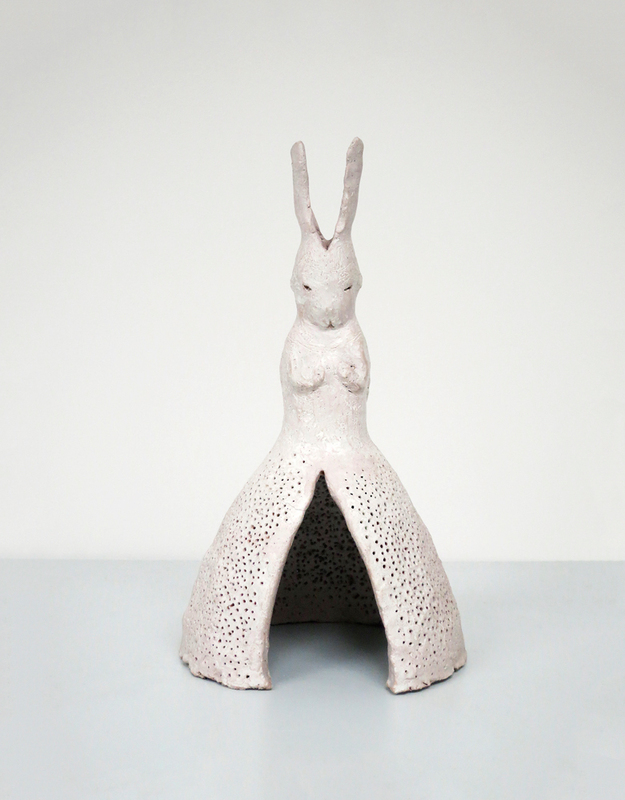 In the late 1980s, the numerous lines that extend from her drawings as part of the process of her exploration of the progenitors of life and, as if in parallel, the terracotta sculptures that she was working on at the same time, began to mutate into “hares” with two long ears on their head. The hares, a product of her own hands, could be described as living a privileged existence, allowed to hop outdoors with wild abandon. 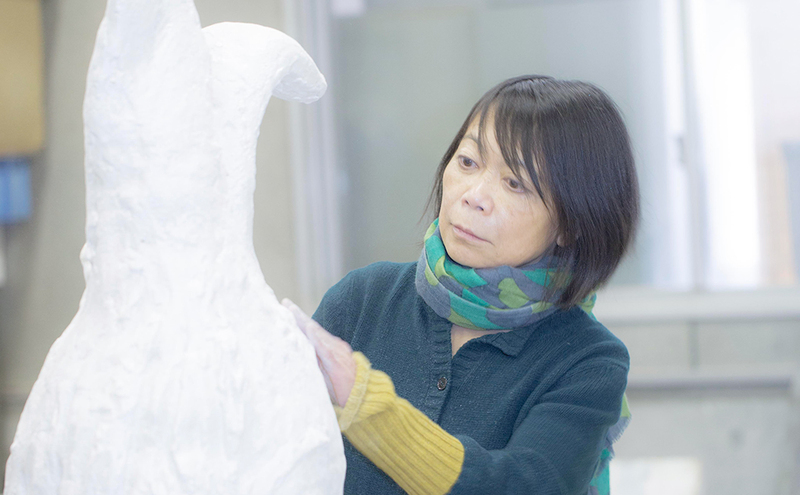 A large number of hares appear in this exhibition from the numerous sculptures she produced in the 1990s to her most recent, which are 3.4 meters in height. In a career of many years, what lies behind the artist’s desire to once again create hares and what thoughts does she invest in these works? The story of the museum and garden told by Leiko Ikemura’s hares is just beginning. Born in Tsu, Mie Prefecture. After studying Spanish at Osaka University of Foreign Studies from 1970 to 1972, Ikemura moved to Spain, where she studied at the Royal Academy of Fine Arts of Saint Isabel of Hungary of Sevilla. She moved to Switzerland in 1979, and then to Germany in 1983. Currently based in Berlin and Cologne, she has been a professor at the Berlin University of the Arts since 1991. She was the recipient of the August Macke Prize in 2009. 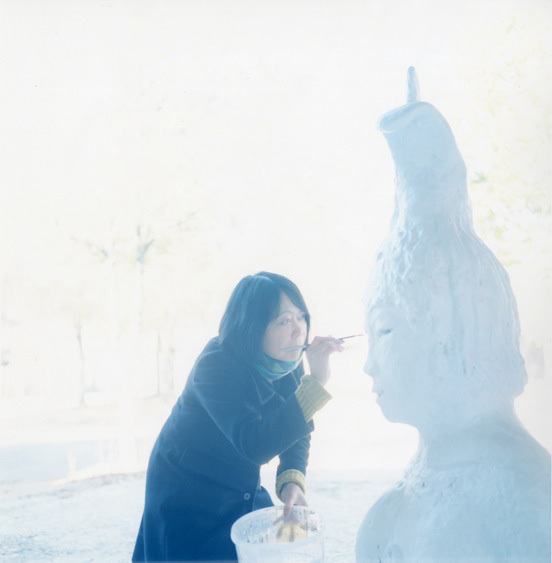 Recent solo exhibitions of her work have been held at the National Museum of Modern Art, Tokyo and Mie Prefectural Art Museum in 2011–12, and the Staatliche Kunsthalle Karlsruhe in 2013. “Leiko Ikemura: PIOON” marks her first exhibition in eight years at the Vangi Sculpture Garden Museum. A monograph on the work of Leiko Ikemura, a highly successful international artist, is to be published in Japan for the first time (scheduled for release in August). In addition to a rich array of photographs of the works themselves and installation views in the exhibition space, the book contains contributions from writers in Japan and overseas. Ikemura and the photographer Rinko Kawauchi also plan to publish a book related to the exhibition in which their respective worldviews are brought together through their photographs, paintings, drawings and words. Take Tomei to Susono IC, then take R246 toward Numazu for 10km. Take Shin-Tomei to Nagaizumi-Numazu IC or Tomei to Numazu IC then Izu Junkan Expwy (Higashi-Surugawan Kanjo Road) to Nagaizumi IC, turn right onto R246 for 5km. Take JR Tokaido Line to Mishima station. Free shuttle bus (25-min. ride) available from North (Shinkansen) Exit.